Much like the sunshine state of California dreaming, the Galapagos Islands are in-season year round. Ahh, to be in eternal summer! High season for tourism tends to be from mid-December to January and from June to August. Rainy season is from December through May when the seas are calm with temperatures in the 80s, whereas dry season is June through November with rougher seas, but there’s a trade-off: The Humboldt Current brings chilly water and cooler temperatures (in the 70s) attracting legendary marine life like schools of hammerhead sharks. I visited the islands during the first week of November and swam with 7 hammerheads. NBD. For a month-by-month run down of specifics, click here. The Galapagos Islands are 600 miles off the coast of Ecuador, so you’ll first need to arrive in the mainland as flights leave from the capital city of Quito as well as Guayaquil to then make their way to the Galapagos Islands. It’s a good idea to spend a night or two exploring either city before catching a flight to the islands in case of delays or cancellations. If you’re bags don’t make it to mainland Ecuador with you, you’ll obviously need more time. Our bags went missing upon landing in Quito (panic!) but were luckily found a few hours before boarding for the islands. LAN Airlines has daily flights to and from the islands of Baltra and San Cristobal. Quasar Expeditions will depart out of these two hubs for each voyage, making travel easy. 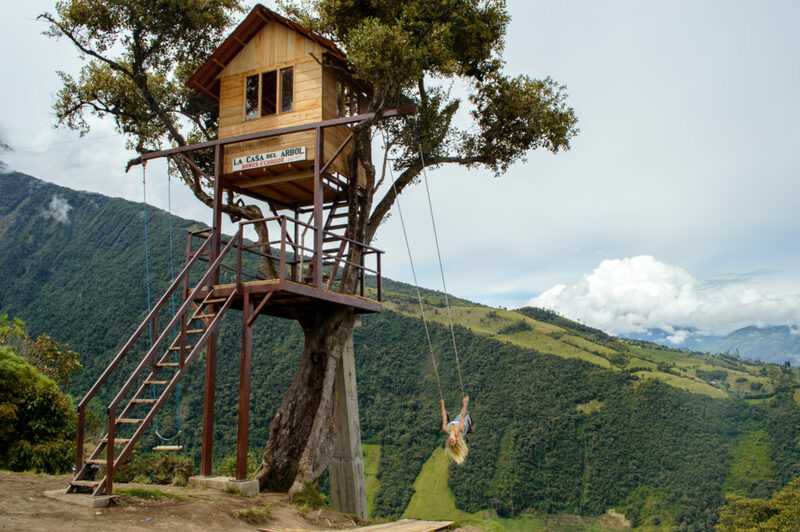 Note that flying times from Quito will be around 3 hours and 1 hour and a half from Guayaquil. Flights will make a pit-stop in Guayaquil to pick up those passengers before heading to the islands. I recently set sail in search of the islands with Quasar Expeditions, the second longest running Galapagos travel company in the business. With over 28 years of experience, it’s an understatement to say these people are experts in the field. A seven-night stay aboard the classic M/Y Grace yacht offers the ultimate luxury adventure with two Master Suites, two Twin Suites and five Premium Staterooms. Live like royalty on this 18-passenger iconic yacht for a week – the same yacht where Princess Grace Kelly honeymooned. Quasar’s love for the nature of the Galapagos’ ecosystem inspired them to offer Galapagos eco-tourism almost three decades ago to share and preserve the beauty of this part of the world. They are a permanent supporter of the Charles Darwin Foundation, working to preserve the Galapagos ecosystem and its endangered species through research and scientific knowledge, while supporting a waste-management effort to protect the Islands. Live it up while diving, snorkeling, hiking, kayaking, wildlife watching, and photographing your heart out. Put on the wet suit and jump in. Fill up memory card after memory card and lay out on the top tier of the boat. Relax in the hot tub and let the warm sun put you to sleep. Dive with hammerheads and snorkel with sea turtles. Hike to the many volcanoes and come back to watch sea lions at play. Am I selling it yet? 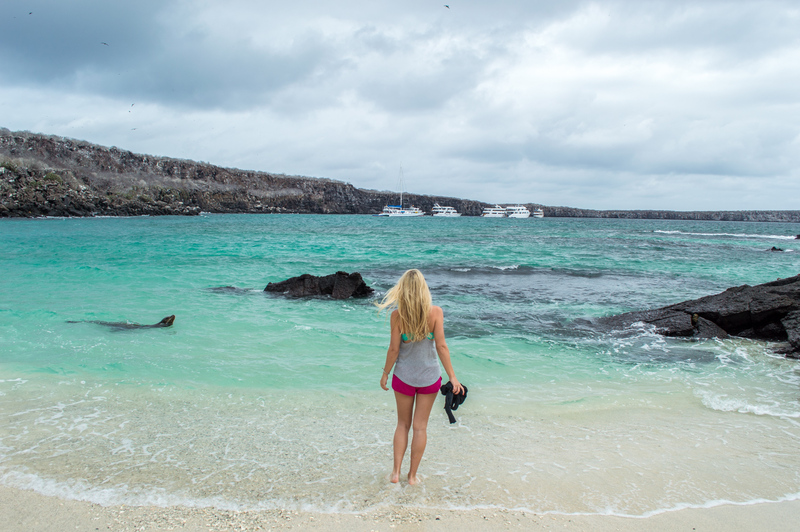 See my detailed itinerary + faces of the Galapagos here. Books – No internet or TV makes for good reading time! Thank you for sharing this information for us. All of this sounds amazing, but how much does a trip like this cost? Amazing! Thanks for the tips. When you went in November was a wet suit necessary? How cold is the cold water?